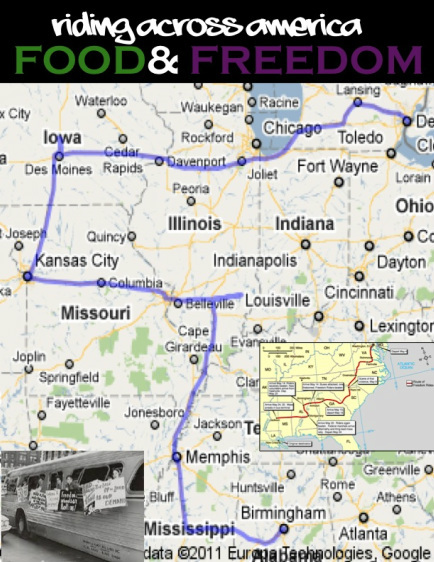 On Sunday August 7th, 13 members of the Live Real community will join Civil Rights leaders in Birmingham, AL to commemorate the 50th anniversary of the Freedom Rides and launch our 12-day journey.Our generation is facing the consequ ences of a broken food system, and its clear that we’re doing something about it. On the ride, we’ll meet farmers whose livelihoods have been threatened by Monsanto, meat processing workers facing unfair working conditions, and Native youth who are working to restore traditional foodways. We’ll end our trip celebrating the urban agriculture revival in Detroit. We’ll also take the Youth Food Bill of Rights on the road, meeting with communities and calling on Congress to take action for a fair 2012 Farm Bill. He will be posting videos throughout the trip so check it out. Follow their tour on twitter, facebook and their blog.